Get your day off to the best possible start with our breakfast! Here at Club MAC, we’ve got a wide range of hot and cold delicious treats on offer. Whether you like a sweet or savoury start to the day, there’s something for you. If you’re in the mood for a cold snack, our varied menu offers up a wide range of continental and more familiar options. 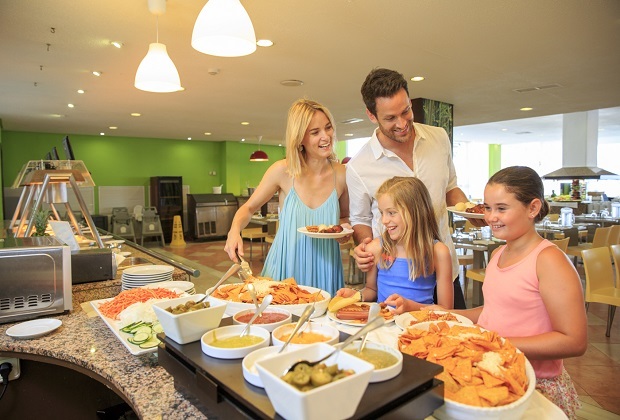 On a typical day, you can expect to find fruits, a buffet of traditional Majorcan breakfast fare, dairy foods and various cheeses and meats. Over on our hot food stations, you can dig into sausages, grilled tomatoes and fried eggs for you to sample. You’ll even find a wide range of hot and cold drinks at our breakfasts. With hot drinks including tea, coffee, hot chocolate and chamomile tea, and cold drinks stations offering a wide range of juices, there’s so much to choose from! Whether you want a light or filling lunch, we’ve got the perfect spot for you in Club MAC! Take a look at our delicious soup of the day, salads and side dishes. If you’re feeling hungry, why not head over to one of our restaurants. Here you’ll find hearty food such as meatballs, fish, various pizzas and pasta meals. There’s even a kid’s corner to make sure that your little one is enjoying their food too! Our lunches are the perfect pit-stop for your busy day. Why not take a break out of your activities or relaxing and tuck into some delicious food? The whole family will love it! At Club MAC, we believe in variety! At our dinner servings, you’ll find a wide range of cuisine and even culinary themes. On any night, you could sample Tex-Mex, Indian or even Brazilian food. Club MAC is the perfect place to indulge in your favourite food or even try something new! Our Spanish themed night is always in high demand. This is your perfect place to indulge in some local delicacies. Whether you’re trying paella, chorizo or gazpacho, you’re sure to love our authentic Spanish nights! Don’t worry if you’re not feeling adventurous though – you’ll still find plenty to eat. We make sure that there are a few standard options, so even the pickiest eater can fill their plate! There are always delicious options available for vegetarians and kids. If you’ve got any concerns with food – whether you’re diabetic or allergic to anything- please let us know and we’ll do our best to point you towards some incredible (and safe!) food. If you’ve still got room, make sure to check out our delectable desserts! From ice cream to cake and even speciality puddings for our theme nights, it’s the perfect sweet end to your meal! Do you have an allergy or any dietary restrictions? Don’t worry, Club MAC can help. When you’re with us, make sure to tell the maître when entering the restaurant of your needs. They can advise on ingredients in each dish, identify what dishes contain the element you/your family member is allergic to and recommend what is safe to eat. Make sure to tell us about what you need. It is best to give us a warning when a guest with food allergies is staying with us. This helps us to prepare and make your stay as comfortable as possible. A few weeks before you arrive, we advise you to email booking@mac-hotels.com to give information of your dietary needs. By doing this, we can make sure that we have alternatives for you to enjoy. This includes gluten free bread and soy milk, as well as some dishes which are allergen-free, so you’ll still be able to indulge in all the foods you love.